Upbeat acoustic Americana "Folk Music for Families" from Nelsonville, USA! 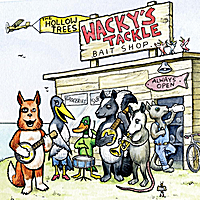 "Wacky's Tackle" is The Hollow Trees' third CD of Folk Music for Families. It features the rollicking good-time folk, country, jazz, and bluegrass from their previous albums, with the addition of horns, accordion, and background vocals. Originals such as "Barefoot Beach" and "Wacky's Tackle" stand alongside such traditional numbers as "The Boll Weevil" and a fast paced horn driven version of "The More We Are Together."